After last nights three hour deluge of rain, thunder and lightning, following an extremely hot day, I think we can officially declare British summertime is here. Not that anyone is complaining, it really was rather spendid and all that water on the plants after all that heat can only be a good thing. So it's time for me to show the first of my new summer makes. I found a couple of vintage curtains to transform. 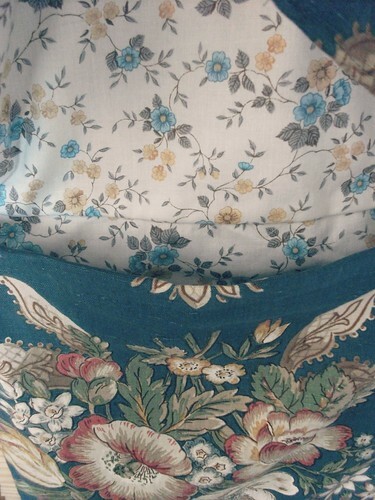 The dark blue floral fabric is some lovely Sanderson fabric. A pretty table cloth and a serviette! I based the size on a bag I already have, made some lining, added a flap and a little pocket. 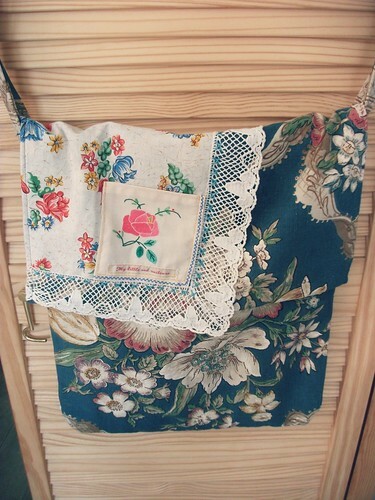 I feel like the bag is a cross between Cath kidston and the lovely granny chic of dottie angel. I'm not sure how either of them would actually feel about that! Lest that sound too easy, I can assure you I had a good wrestle with the lining fabric and strap! But it somehow all found it's place. All I need now is a dusting of granny chic bravery as I step out wearing my transformed curtains, table cloth and serviette. What's that?......oh of course, that is the whole granny chic point! Well I do love it so I shall be brave, and today's the day. It was so nice to use up some of this fabric, I have been collecting madly. The cross stitch on the little handy pocket, inspired some more around the flap. This is a secret pocket/label for hiding secret lists in. Lists of adventurous and brave things. And maybe a shopping list too. So wish me luck as I step out with some hopeful granny chic bravery. Oh and Miss Trissie was very happy about it too! 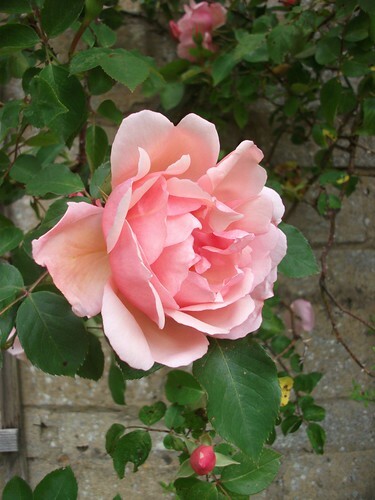 Have a lovely summery weekend. It's so pretty! I just love it. I love your little labels too, where did you get them? They're a lovely touch. 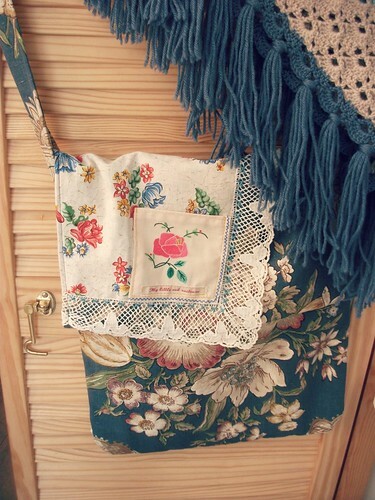 Absolutely love the bag and your use of vintage is inspired! Wish I had your skill, Heather. Really lovely. I should make a "just right" bag like yours. I know what you mean about bag sizes, as I am only 4' 10" I can be swamped (especially with shopping bags that drag on the ground with only two items in lol). bag making is 'on my list' but don't have a lot of skill.....one day tho. 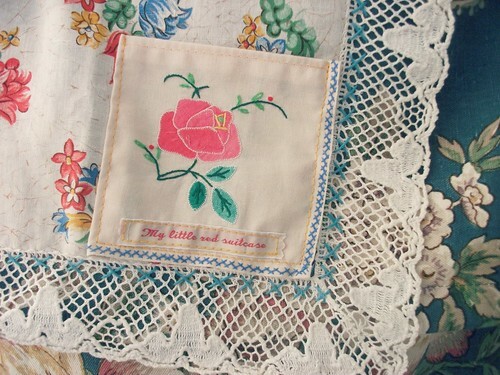 I love the lacy edging and the little name tape too... enjoy using it! It has been ever so warm, but I do love a good thunderstorm. I love the dark blue fabric and your bag transformation is lovely. So beautiful, and I adore the lace edge. Perfect! Have a great weekend. Oh my goodness!!!!! That is absolutely gorgeous! GORGEOUS!!! I love everything about it, the colors, the fabric... everything! I wish I had half the talent you do!